You'll begin your trip at our Adventure Centre in Queenstown where you'll sign in and meet your guide for the day in our departure lounge. Next, we'll drive you to our custom built canyoning base where you'll be fitted with all of your canyoning gear. We have heated change rooms, showers and toilet facilities. We also have a locker facility where you can leave your towels and a change of clothes for the day. Following a safety briefing, our guides will take you on a short walk to the Queenstown canyon through a beautiful, ancient beech forest that hides the high-walled canyon. You'll then descend and explore the canyon by zip line, abseiling (rappelling) waterfalls, plunging into natural pools, floating down narrow passageways and cascading down chutes - all in beautiful natural surroundings. It's an awesome and exhilarating feeling. The Queenstown Explorer is suitable for all abilities and is a great option for families. 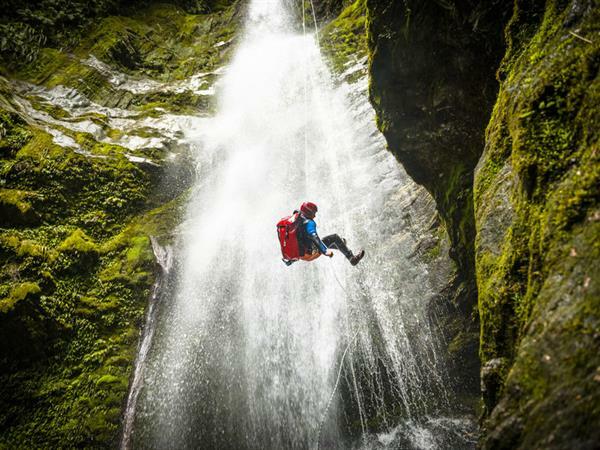 No previous canyoning experience is required and you don't need to know how to swim but you should be confident in water. You can choose the level of challenge you want throughout your trip - our guides can provide alternative routes for you and will instruct you through every adventure!